First Environmental provides emergency response services primarily to the Southeast United States and a call to one of our highly trained emergency coordinators will initiate a rapid and well organized response to your situation. We also coordinate the response with local, state, and other government agencies. We always have one of our highly trained personnel available to answer your phone call and that reliability has allowed us to separate ourselves from all other industrial contractors. As a full service remediation contractor, we are also able to provide transportation, disposal, and closure after the emergency is controlled. 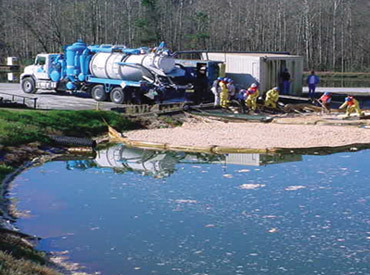 We maintain a specialized inventory of equipment and materials to respond to just about any hazardous material response and our personnel have substantial experience in transportation spills, petroleum releases, chemical spills, railroad tanker derailments, fire damage remediation, and bio hazard incidents. We also have the ability and the experience to handle groundwater treatment, free product recovery, material neutralization, tanker truck roll overs, chemical transfers and PCB releases from transformers. First Environmental has the equipment and training to solve any industrial cleaning problem you have at any time it may occur.